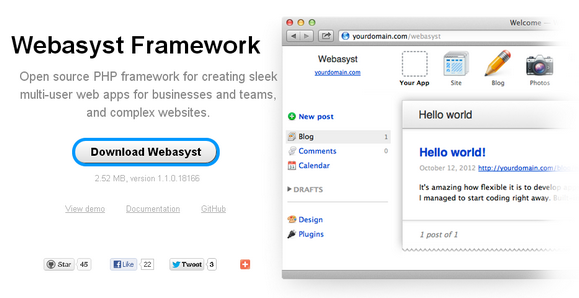 Webasyst is a new open source PHP framework for developing sleek multi-user web apps, and complex websites. Comparing to other frameworks such as Zend and Symfony, Webasyst framework stays more focused and allows building apps for business and team usage more quickly and efficiently. The framework offers lots of ready-to-use tool for user management and authorization, UI building, mobile-ready access, etc. Webasyst framework has been designed in such a way that within a single installed software instance, several different applications can be installed and used. It was one of the main goals of creating the framework to allow tight integration and interaction between several applications. Webasyst released under LGPL license that permits creation of commercial applications, which makes Webasyst a great platform for developing web apps for businesses. Thanks for this informative post I think this is a better framework than others. I will surely try this one in making complicated programs. Good job! PHP is multi-user web application because it is a powerful, open source, object-oriented framework and it’s based on simplicity and a rigorously tested agile codebase. Extend the functionality of your servers with scripts or create powerful web applications to manage all features.